3 January 1950 – Agreement on the hall plan reached with architect. 30 March 1950 – Diocesan approval of the plan announced by the Vicar to the full committee. 20 April 1950 – A Social was given in the Ballroom of the Ocean Hotel. 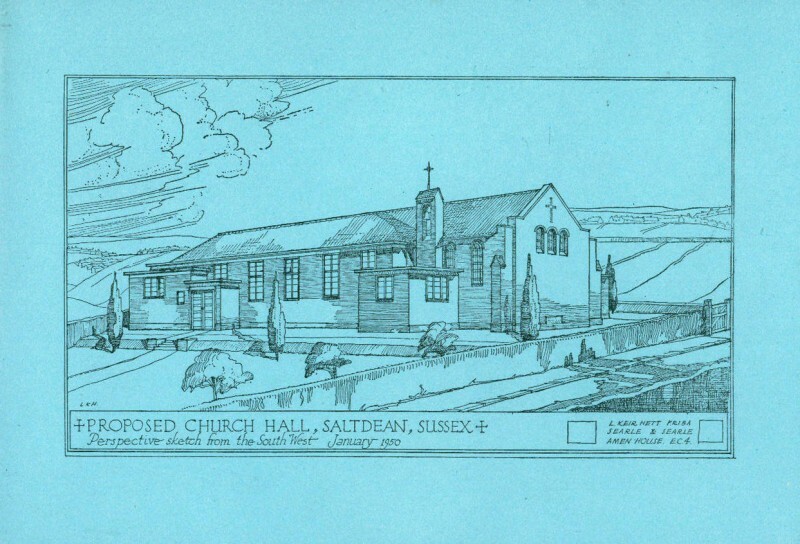 Copies of the plan for the proposed Church hall were distributed to supporters and further explained by the Vicar Rev G W Taverner of Rottingdean. Some alterations were later made, an organ chamber was formed by taking part of the ladies cloakroom and an outer door was planned for the vestry. 25 May 1950 – last Holy Communion service at Farel Down. 2 June 1950 – Church Commissioners approval of plans and terms for loan (£4,480) received by full committee. 11 June 1950 – First service at the new temporary church – Sports Pavilion in Oval Park, which held up to 30 people. Twice monthly services held. 24 June 1950 - Garden Sale at St Anns, Crowborough Road. Stalls at the sale included: Cake and Confectionary; Fancy Goods; Edible Goods; Greengrocery; Electrical Domestic Appliances; Glass and China; Books and Stationary; White Elephant; Admission 6d. 30 November 1950 – The Building Licence was granted. Messers Rice & Sons of Brighton were chosen at their tender of £8,736. December 1950 – The arrival of the Rev R H G Johnston, a permanent assistant curate for the parish, and preparation of the site had begun. 21 April 1951 – The Laying of the Foundation Stone of St Nicholas Church Hall, Saltdean - The Foundation Stone was laid by the Earl of Bessborough (Chairman of the Chichester Diocesan Board of Finance) at a service conducted by the Archdeacon of Lewes (the Ven J H L Morrell ). Subscribers who donated money at the site or at the reception which followed the laying of the foundation stone had their signatures taken and these were transferred and embroidered on curtains used in the hall. The Hall seated 230 people. 300 people attended the open air service, over £100 in donations was collected at the service. A reception was held afterwards at the public hall Rottingdean. 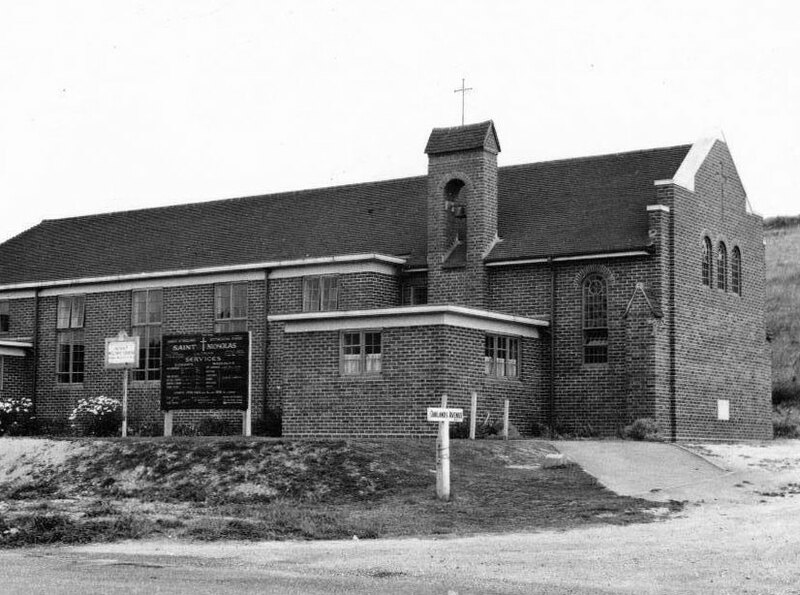 14 October 1951 – last Holy Communion Service held at this second temporary Church. 20 October 1951 – Dedication of St Nicholas Church Hall Saltdean - The present Church Hall was dedicated by the Rt Rev The Lord Bishop of Chichester ( Dr G K A Bell) at an impressive service. The Bishop of Lewes (the Rt Rev Geoffrey H Warde), the Archdeacon of Lewes (the Ven J H L Morrell), the Rural Dean of Brighton (Canon F N Robathan OBE)and several visiting clergy were present with a crowded congregation. 21 October 1951 – Full services in the new Church Hall commenced. 27 October 1951 Brighton & Hove Herald reported –“ £4,000 in three years subscribed for the Building Fund. Dr Bell said ‘that when history is written in years to come the people will be amazed that the parishioners collected so much money for the church in such a relatively short time.’ The church will cost between £10,000 and £12,000, is a sister church to that of Rottingdean. It is anticipated that Rev R Johnston, Curate, will conduct many of the services. Rev Johnston came to Saltdean from St Augustines, Preston.